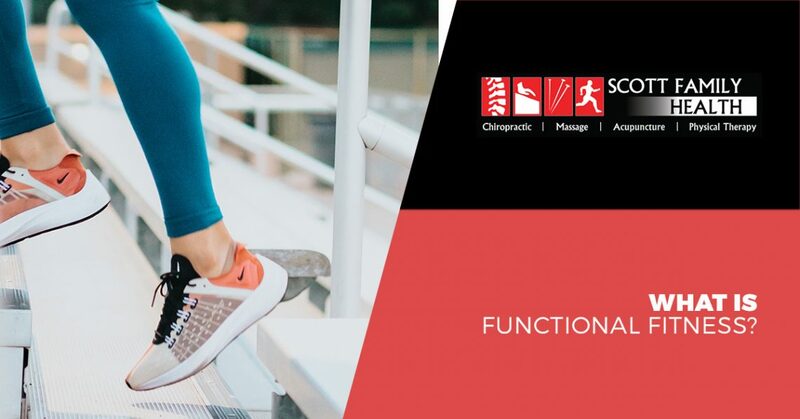 Physical Therapist Loveland: What Is Functional Fitness? When most people think of fitness, they think of someone jogging around Lake Loveland or lifting heavy weights at the gym. Fitness culture is chock-full of six packs, supplements, and people pushing their physical limits to either improve their athletic performance or their body composition. Believe it or not, this is only one small corner of the fitness world. For most folks, fitness is about moving better, feeling better, and improving their overall quality of life. This concept is referred to as functional fitness, or functional fitness training. Working with a physical therapist is an excellent way to improve your functional fitness. While many people assume physical therapy is exclusively for those who are healing from injuries, it’s also a useful tool for those who want to improve their flexibility and mobility. In this blog, Scott Family Health will answer two questions: what is functional fitness, and what are its benefits? Our physical therapists in Loveland are happy to help you create a functional fitness plan for your needs — schedule an appointment or call us directly to get started! When we develop physical habits — positive or negative — they can have a huge impact on how our muscles and muscle groups work together. It doesn’t matter if we’re constantly lifting boxes, swinging a baseball bat, standing at a counter, or sitting on a couch — muscles will interact differently over time when exposed to the same repetitive motions day after day. They “train” themselves to respond to our posture and movements, and this can change our body composition, limit our mobility, and cause pain. Functional fitness training is designed to retrain muscles to work together to keep the body healthy and aligned. Below, you’ll study an example of how muscles train themselves in an unhealthy manner, and how functional fitness training from a physical therapist can reverse these effects. Humans weren’t designed to sit at desks every day. Someone who sits in the front of a computer five days a week and constantly hunches their head forward will notice that their trapezius muscles (the large muscles on the back of the neck) will become tight and tense, while the levator scapulae and scalenes (muscles on the front and side of your neck) will become loose, sore, and weak. Because the head is in a forward position, more weight is placed on the spinal column — and as a result, the trapezius muscles have to work harder to hold the head up. This can lead to muscle tension, headaches, limited mobility of the neck, and more. In order to correct these muscle imbalances, a physical therapist will create a functional fitness training plan that helps the person dealing with neck pain to a) strengthen the weak, loose muscles in the front of the neck and b) stretch and the relax the tense muscles in the back of the neck. The physical therapist might also recommended exercises that strengthen the core (a strong core is the key to good posture). Over time, this exercise regimen should deliver a certain level of functional fitness that will ease neck pain, reduce weight on the spine from forward head posture, and help the person get through their workweek with less tension and pain. That’s what functional fitness is all about: helping people to be fit enough to function at their very best. If you’re having trouble getting through your work week without pain, or you’re struggling to keep up with daily tasks around the house because of a lack of mobility or flexibility, call the team at Scott Family Health. Depending on your condition and your needs, our chiropractors and physical therapists will work together to create a functional fitness plan that helps you live a better life. At our Loveland office, Dr. Kirsch and the rest of our physical therapists are kind, friendly, and supportive throughout your functional fitness journey. We create functional fitness plans that can be done at home or at the office, so you can improve your health without tons of weekly appointments. Functional fitness is important — and it should also be convenient! Get started by scheduling an appointment at our Loveland office today.